Things have gotten real overwhelming lately, so this blog is on hiatus for a couple months. When we return, there’ll be a snazzy new design and everything! Thank you for your patience, and have good spring. This entry was posted in Uncategorized on May 5, 2017 by joannalesher. Today’s book is called How to Get Her to Watch Sports, Have Snuggles, and Call Her Best Friend for a Chat. This entry was posted in Uncategorized on May 17, 2016 by joannalesher. 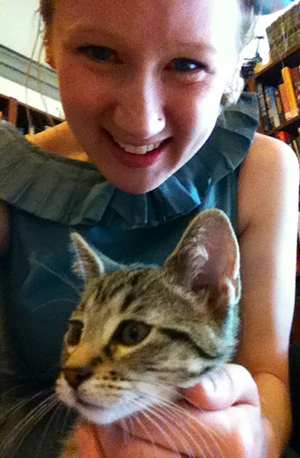 Minerva the bookstore cat is 10 weeks old and lives at Off the Beaten Path Books in Farmington, Michigan. I snatched her up because she was trying to knock a gigantic Stephen King book off a stand. Guess she’s not a fan of his later work. Oh, to be a bookstore cat!